For several years, SMHC has been studying several concepts of directional and identification signage. The directional and identification signage is the primary tool to ensure and facilitate smooth navigation throughout complex places such as hospital centres. The novelty is the addition of letters as a new method of designation of our pavilions. Pavilion A, Main Building and Connecting Building (loading dock); Pavilion C, Boiler Building; Pavilion D, West Wing; Pavilion E, Chapel Building, Human Resources; Pavilion F, Daycare Centre; Pavilion H, Hayes Pavilion (Annex). See plan below. The Admitting Department is located on the Ground Floor of the Hospital, in room G-308. Upon your arrival, the staff will help you to complete your admission. Should you be transferred to one of the floors following treatment in our Emergency Department, a member of our Admitting Department will go to see you in your room. If your admission has been scheduled in advance, you will be called to confirm the date and time of your admission. How to get to SMHC? St. Mary’s Hospital Center is located in the centre of Montréal, in the Côte-des-Neiges-Notre-Dame-de-Grâce borough, between Lacombe Avenue and Jean-Brillant Street. Métro: Côte-des-Neiges (exit West) Bus: #165 or 435, Côte-des-Neiges Road. BIXI station: Lacombe Avenue at Côte-des-Neiges Road. Limited parking is available at the front of the hospital. Rates are posted outside. 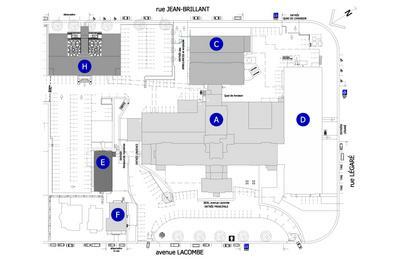 Information concerning parking fees can also now be found on the Montréal West Island Integrated University Health and Social Services Centre's website. Visiting Hours: St. Mary’s has flexible visiting hours. Please consult the "Patients and visitors" section for more details. All Nursing Units including Intensive Care and Long Term have unlimited visiting hours with the following exceptions: Obstetrics: Husband & close family 07h00 - 20h30. Friends 15h00 - 20h30. Psychiatry: Every evening 19h00 - 20h00. Weekends & holidays 14h00 - 16h00.